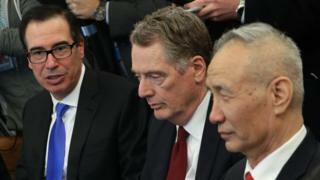 US officials plan to travel to China next week to resume face-to-face talks aimed at ending a trade war between them, the White house has confirmed. And Chinese officials will travel to the US for further talks in Washington in early April. The US and China have imposed tariffs on billions of dollars' worth of one another's goods over the past year. A truce at a G20 meeting in December made way for talks, but negotiations have at times been rocky. Despite that US President Donald Trump has cast talks in a positive light, saying they are going "very well". US Trade Representative Robert Lighthizer and Treasury Secretary Steven Mnuchin will fly to Beijing to start talks with Chinese Vice-Premier Liu He on Thursday, 28 March. The US principals will be accompanied by deputy trade representative Jeffrey Gerrish and other senior officials from the Office of the United States Trade Representative and the Department of the Treasury. The Chinese delegation led by Mr Liu will visit the US on 3 April with the aim of closing a deal by late April. The talks have taken longer than some had expected, with officials at times making contradictory comments on their progress. Previous US and China talks broke up without a deal on 15 February, with the US warning "very difficult issues" remained unresolved. Even though by the end of the month Mr Trump said the two sides were "very very close" to signing a trade agreement, a deal has not yet been forthcoming. He also delayed a 1 March deadline for raising tariffs last month citing the progress being made. The US accuses China of stealing intellectual property from American firms, forcing them to transfer technology to China. Washington wants Beijing to make changes to its economic policies, which it says unfairly favour domestic companies through subsidies and other support, and wants China to buy more US goods to rein in a lofty trade deficit. China accuses the US of launching the largest trade war in economic history and is unlikely to embrace broader structural changes, which are seen by some as a way to contain its rise. Important sticking points in negotiations include how to enforce a deal and the pace at which the US and China will roll back tariffs imposed over the past year, the Wall Street Journal said. Chinese officials say President Xi Jinping does not want to participate in a summit with Mr Trump unless the main issues in the trade talks are agreed to avoid a situation where Mr Trump could walk away at the last minute, according to the Financial Times. Failure to achieve a deal would likely see the US more than double the 10% tariffs on $200bn of Chinese goods and impose fresh tariffs. Mr Trump has in the past threatened to tax all of Chinese goods going into the US. The US has already imposed tariffs on $250bn (£188.6bn) worth of Chinese goods, and China has retaliated with duties on $110bn of US products. Mr Trump has also threatened further tariffs on an additional $267bn worth of Chinese products - which would see virtually all of Chinese imports into the US become subject to these tariffs. The damaging trade war has cast a shadow over global trade and is contributing to a slowdown in the world economy.